If your child is at reading level D or above, he or she may be ready to work on long vowel spellings. Begin to introduce long vowel spellings to students at reading level D or higher. Students below level D should continue to review short vowels, but may also benefit from an introduction to long vowel sounds. Long and Short Vowels: "A"
With this worksheet, your child will match picture names to creatures representing short "A" and long "A" vowel sounds, then glue the pictures to the page. Tangrams are shapes puzzles that can help your child build math skills. Offer students hands-on tangram activities to help them understand that shapes can be put together to create new shapes. 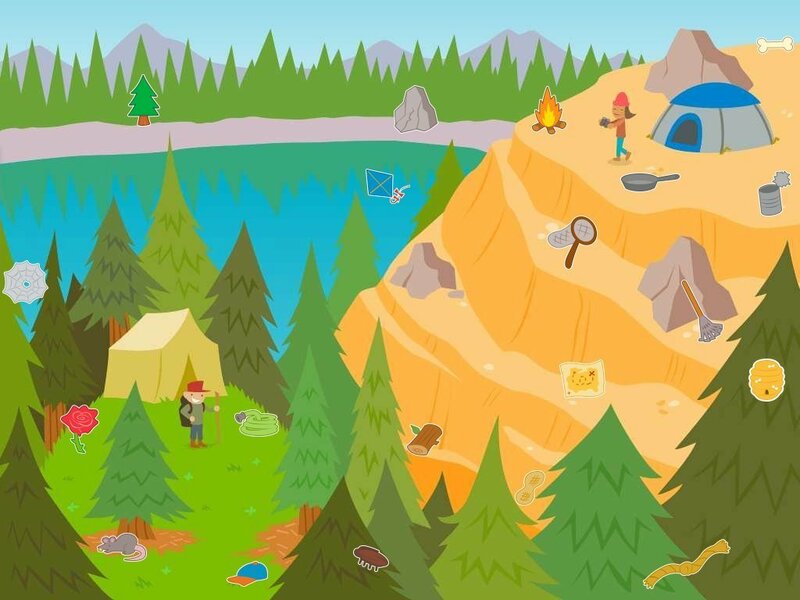 Use this fun outdoor-themed worksheet as you engage your students in identifying 2-D shapes! 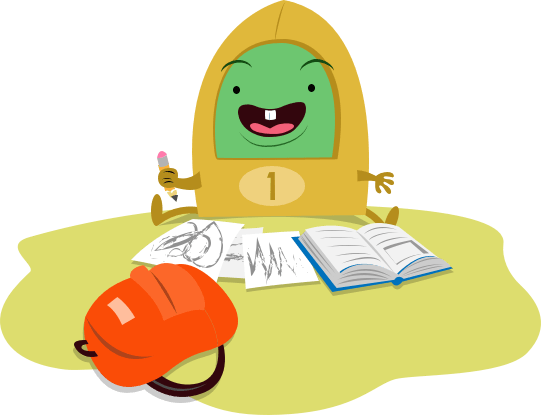 Here's a fun challenge for little learners to build math and reasoning skills. 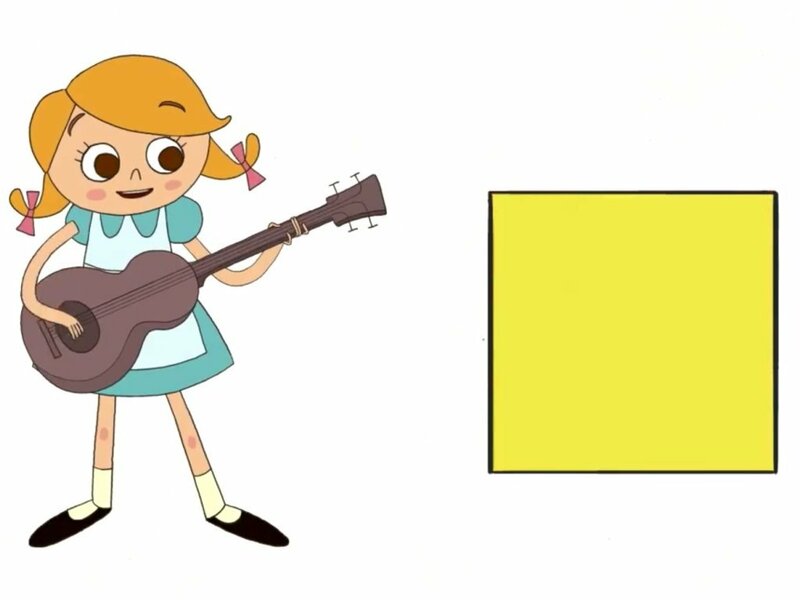 Your child will re-create this picture using the geometric tangram shapes. Help! The rabbit is lost and needs to some help getting to her garden! Follow the squares to find the path. 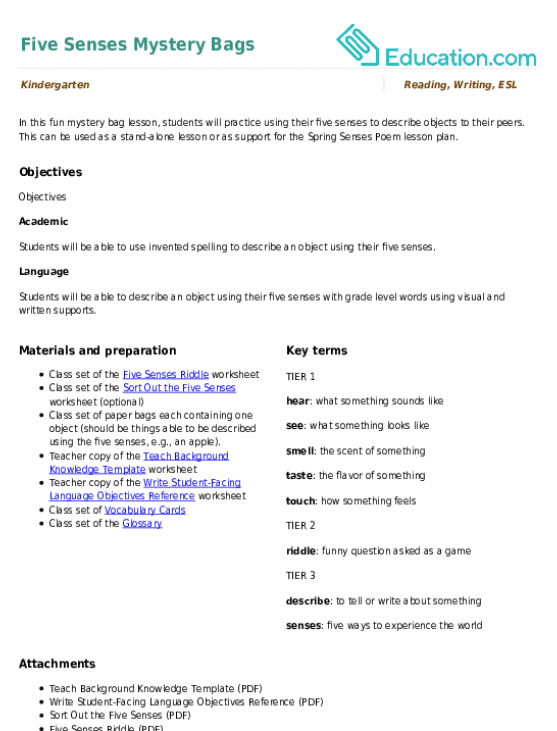 Try incorporating some poetry into your reading routine! This can help your child review language arts skills. Display poems around your classroom on chart paper for shared reading. Poetry is a great opportunity to practice fluency and to review blends, digraphs, long vowel spelling, and sight words. 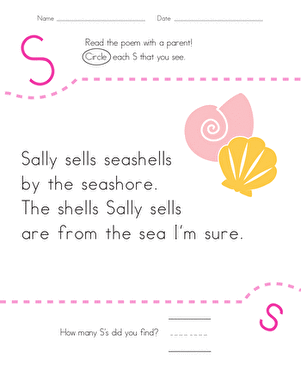 How many S's does Sally have in her seashell tongue twister? Kids find and count each letter S in the silly poem on this kindergarten reading worksheet. 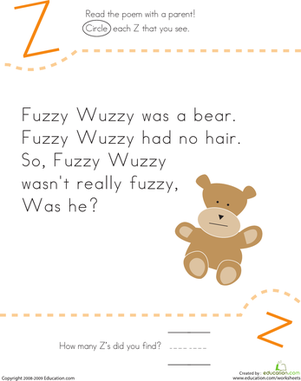 How many Z's does Fuzzy Wuzzy have in his tongue twister? Kids find and count each letter Z in the silly poem on this kindergarten reading worksheet. 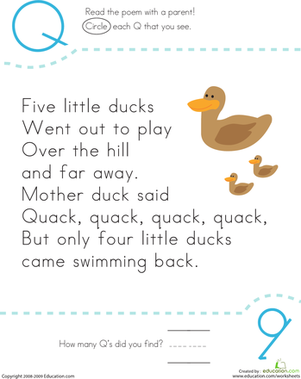 How many Q's can your child spot in the Five Little Ducks poem? Kids find and count each letter Q in the rhyme on this kindergarten reading worksheet. 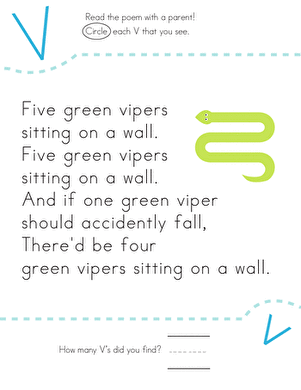 How many V's do the vipers have in their rhyme? Kids find and count each letter V in the rhyme on this kindergarten reading worksheet. 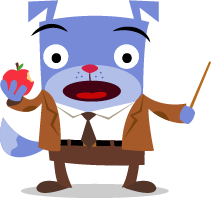 In this fun mystery bag lesson, students will practice using their five senses to describe objects to their peers. 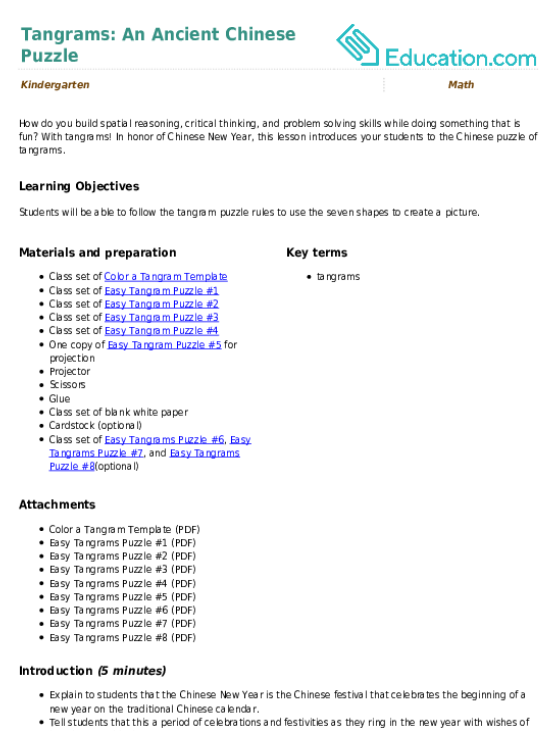 This can be used as a stand alone lesson or as a pre-lesson for the **Spring Senses Poem** lesson plan. 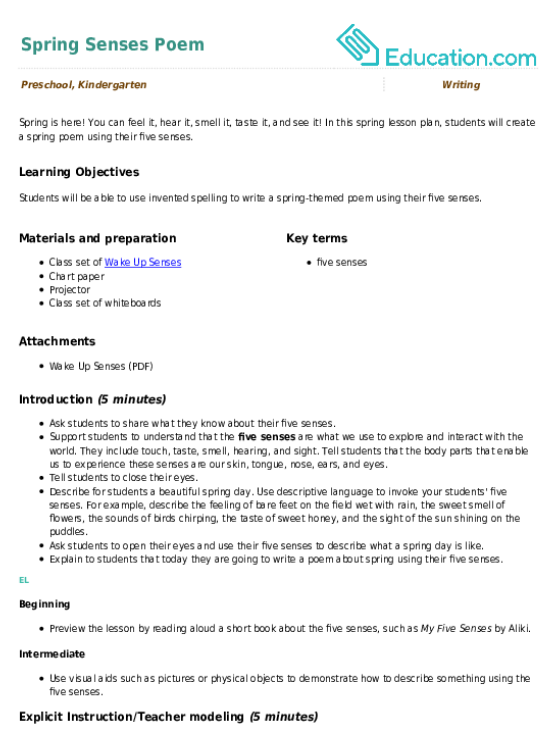 Is your child interested in a particular nonfiction topic, like sea animals? Extend learning by tying art into your studies. Have your child create a detailed drawing or painting of an animal they have studied. 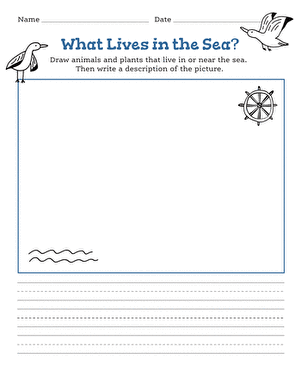 As students begin to tackle nonfiction writing, provide them with leveled books on the subject they are learning, and ask them to include facts they gather in their writing. Tie in a fun art project with their writing to display at the end of the year. Practice creative writing with some simple sentence prompts. Fill in the holes to describe what it's like to swim in the ocean. Break out all of your informational books about sea turtles to help your kindergarteners learn even more interesting facts about this amazing sea creature!